three CHARACTERS ⎜ three COUNTRIES ⎜ one ADVENTURE. 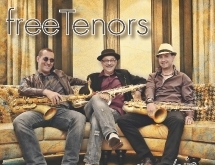 freeTENORS takes you on a musical adventure with phenomenal musicians from three countries — Austria, Czech Republic, Slovakia. 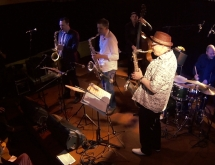 Harry Sokal — the founder of the band — is one of Europe’s greatest saxophonists.With the idea of forming a band of three saxophones, Sokal began collaborating with Ondřej Štveráček and Bernhard Wiesinger, two young colleagues from the Czech and Austrian jazz scene. This ensemble embodies musicians who are searching for a fresh, unconventional, unprecedented approach to the standard jazz form. After the opening of the Iron Curtain in 1989, Harry Sokal was one of the first in Austria to seek like-minded musicians in Slovakia and the Czech Republic. With Tomáš Baroš on double-bass and Marián Ševčík on drums, he found the best in their craft and musicianship. They create one of the most remarkable jazz rhythm sections, intensifying the freeTENORS’ colourful, thrilling sound and musical cohesiveness. The virtuosity and musical skill of these world class musicians inspire their audience to reach greater heights of perceptive listening and to explore a deeper love of jazz. Harry Sokal, born in 1954, is one of Europe's leading post-Coltrane saxophonists. He has worked with the whole A-to-Z of European and American Greats, from Art Blakey to Joe Zawinul. He was a founding member of the Vienna Art Orchestra and also played in the legendary Art Farmer Quintet. In addition, he has initiated and directed a wide variety of projects with other national and international musicians, as well as his own projects, such as Depart, Full Circle, Roots Ahead, Voices of Time, Stories and freeTenors. In 2005, he won the Hans Koller prize for Musician of the Year and the annual Culture Award of Lower Austria in 2011. Bernhard Wiesinger, Postgraduate study at the prestigious Berklee College Of Music Boston/USA 2005/06. Master degree in saxophone at the Konservatorium Wien Privatunversität in 2008. 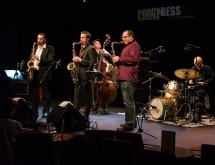 Since 2006 docent at the International Jazzworkshop at the Poysdorf Jazz & Wine Summer. Leader of his own jazzband B-Double-U Organ Quartett. With Geri Schuller initiator of the world music project Miss Moravia (www.missmoravia.com). Credits: Joris Dudli Sextett, Fritz Pauer, Don Menza, John DiMartino, Christian Havel, Juraj Bartos, Simone Kopmajer, Marianne Mendt, Richard Österreicher, Pete McGuinness, and many more. 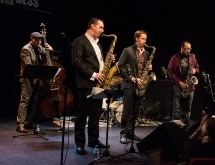 Ondrej Štverácek, The extraordinarily gifted tenor saxophonist Ondřej Štveráček enjoys freedom of jazz with a similar exhilaration as the remaining up-and-coming Czech musicians. He has been a regular member of Gustav Brom Big Band for many years now, has collaborated with the most outstanding young musicians from both the Czech and Slovak Republics as well as with artists from abroad (Jerry Bergonzi, Dave Liebman, George Mraz, Dennis Rowland, Douglas Sides, Poogie Bell, Kalman Olah, Matuš Jakabčic, Juraj Bartos, Oskar Rozsa, Milan Svoboda, Marti Valihora and many others...). Apart from activities as a sideman, he focuses primarily on his own concept of playing the saxophone, undoubtedly inspired by the jazz tradition. Tomas Baros, was born on 31 August 1985 in Teplice. He belongs to the youngest and most talented contrabass players at the music scene. Coming from musical family, his father, Julius Baros, a well-noted trumpetist, has been his music inspiration. He has been teaching him since his early age. 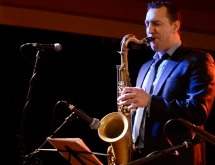 He has been performing at the Prague jazz scene since 14, always with the best jazz musicians of the Czech Republic. He studied classical double bass at the Prague Conservatory in the class of professor Kvetoslav Borovicka and Petr Ries. In 2004, he recieved the Berklee College of Music in Boston scholarship. As a performer, he has played with stars like Alex Sipiagin, Benito Gonzales,Roberta Gambarini,Piotr Wojtasik,New York voices, John Betsch,Deborah Davis, Adam Pieroncik,Igor Buttman,Benny Golson,Rick Margitza, and many more. Marián Ševcík, is one of the most influential Slovakian drummers of his generation. His performing and recordings credentials feature participation in premier European Jazz ensembles, both small group and big band as well as collaborations on folk music projects with well known Slovakian artist Ida Kelarova and her band Jazz Famelija. Marian studied percussion at the Zilina Conservatory of Music and Bratislava Conservatory of Music respectively (both Slovakia) before continuing his professional career. In 2008 he received the “Jazzman of the Year” awarded by the Music Fund of Slovakia. He cooperated with great musicians over the years including Piotr Baron, Boris Kozlov, ,Benito Gonzalez, Joel Frahm, Steve Haines, Roby Lakatos, George Mraz,Alex Sipiagin, Donny McCaslin, Matus Jakabcic Big Band, Ondrej Krajnak Trio, Lubos Srámek Five Reasons, ariska-Carniaux Sextet, and Pavel Wlosok, and many more. Bernhard Wiesinger... "...more than an insiders´ tip."